I didn't notice any threads where we can ask questions about the wiki, so I took the liberty to make one! So yes, anyone with any questions regarding the forum should be posted here. This will obviously be more used when the Wiki takes off, but I thought we should have it now. So yes, I have a question of my own; Should we add a 'W' on the favicon for the wiki so it can be easily distinguished between the forum? Should we add a 'W' on the favicon for the wiki so it can be easily distinguished between the forum? It's a really nicely made image, what's the worry that someone will arrive only at the wiki address and not realize there's a forum attached? Or visa versa? I think Red means it for convenience when browsing, so we can tell the difference between the tabs. I can try to do that. How do we put images on the Wiki? Is that enabled now, or something special I need to do to get it to work? I tried a few ways to post remote image links but it doesn't like that. I really like the new logo NonZero, but I still don't think people would be able to twll the difference. Yeah. I was thinking like adding a small Wikipedia 'W' in the bottom right corner. This is my first time posting on this forum, so I apologize if I'm making any mistakes about where to post what, etc. I wanted to edit or at least add something to a discussion page on the wiki. 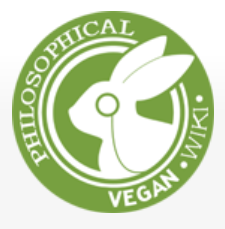 I made an account on the philosophical vegan wiki page for such a purpose, but I do not seem able either to edit or to add to the discussion page. In both cases when I clicked on 'view source' I received the message 'You do not have permission to edit this page, for the following reason: The action you have requested is limited to users in the group: trustedUser.'. I'd be most grateful for any help anyone might be able to offer in gaining the ability to edit or add to the discussion page. Must I do something in particular to gain someone's trust? Sorted, sorry about that, we've already had our first troll attack so security is high. Feel free to make an introduction post or write some details about your interest in the wiki project in your profile page on the wiki. Welcome to the forum Margart! Please post an intro if you haven't. I changed some permissions around. I made a new group called 'intermediateUser', which trustedUsers can add people to. IntermediateUsers can edit pages but not add other people. And they can be blocked by trustedUsers. This will prevent any propagation of spamming or vandalism. Margaret is obviously not vandalizing and has already made some good contributions and edits, but I would say we don't know her well enough yet to know she wouldn't add others who might not be as considerate. We definitely need to establish some editing guidelines, though. Any substantial edits of what others have contributed -- particularly those involving disagreement -- should be discussed on the forum first, it's very difficult to have a back and forth on the Wiki and keep track of things. Margaret Hayek wrote: In response, those who wish to share an alternative perspective might worry about the extent to which they ipso facto get labeled as 'apologists' and are accused of 'attacking' those who have a different view. They also might not understand why there is such worry about a cult and hijacking of vegan youtube by someone who has only 13,000 followers. We care because Vegan Gains has a huge following, and has promoted this through debates to an even larger audience. The issues of intellectual dishonesty and apologia for or opposition to action against pseudoscience and pseudophilosophy are substantive and probably warrant their own articles. Margaret Hayek wrote: Those who hold the view that concerns about NTT's deleterious effects are exaggerated might be very glad that information is being shared about its logical shortcomings and that the text of arguments without those shortcomings is in the process of being linked to these discussions. But they might attempt to clarify that, if critics are so concerned about NTT being popularized on Youtube at the expense of better arguments for the same purpose, it would be nice if these critics would undertake some popularization of these better arguments, perhaps on Youtube. They might agree that it would be naive to think that the sheer superior rational force of better arguments would cause them to spread - but that this is all the more reason for those who find it dangerous that NTT is being used in the place of them to do more to actively spread the better arguments, beyond begin the task of explaining why they are better on this wiki. This is sincere - it seems for instance that in an early debate Vegan Gains took the wording of NTT from Isaac in the comments section, not only because he's a long-time supporter of Isaac, but because he really was looking for a short convincing ethical argument that gets the rational force across quickly and efficiently. It at the very least had the practical drawback of the second premise being pretty difficult for many people to comprehend on the fly. If there was something better to offer (and proponents of this view would be inclined to agree that there is) it really would be good to make it available to people for such contexts. This was already addressed in editing in the article, although she might have missed it. Thus why the forum thread is more suitable for these discussions. "Better" from an objective standpoint is not necessarily the same as what will be perceived by biased and uncritical activists as better. Ineffective and counter-productive activism based on the flaws of human psychology is predominant (look at how many activists use accusatory and alienating approaches). NTT leverages many biases to gain unfair advantage in the activist's mind against objectively better arguments (such as laziness, because the best arguments are empirical, and science is HARD). We can work out how to clarify this in the wiki, but we should discuss it here first if possible. It may even warrant an entire article, because this criticism is likely to be repeated. As to the focus on NTT right now, it is topical and we can't afford substantial distraction while people are interested in this. Edit: I guess I can't do that yet, because it's hard to tell what has been edited. Only thing is to make smaller edit histories of only the wording, so you can do the paragraphing/spacing at a different time which is the thing that confuses it.